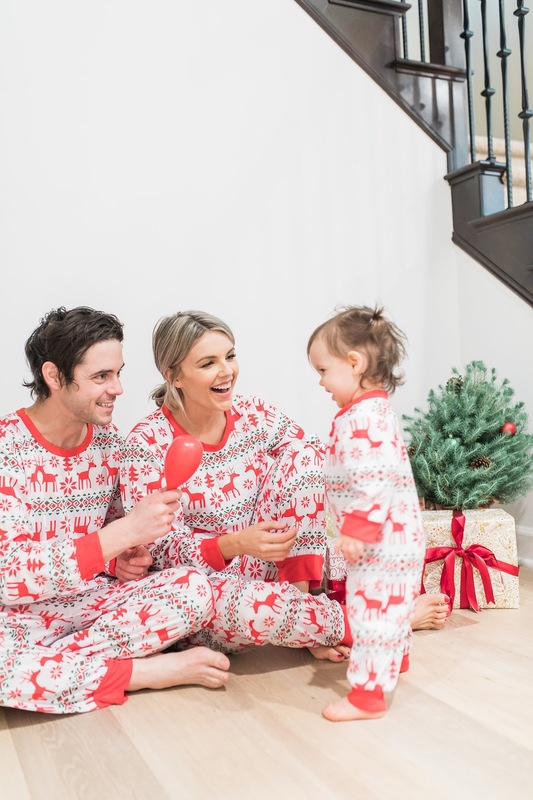 Christmas PJ’s for the Fam for Under $20! Now that we’ve celebrated Thanksgiving, we are officially in Christmas mode over here at the Manno household! Honestly, we almost didn’t put up any Christmas decorations because we are right smack dab in the middle of moving and it felt like a lot to put up Christmas decorations only to take them down at any moment to move. The reason we don’t know our exact move date is because we don’t know when our loan will be approved. It’s a long story! So basically we could move into our house right before Christmas or right after, and not putting up any Christmas decorations just felt wrong. So a few days ago we took our family Christmas PJ photo! A couple years ago, I started giving matching PJs to my family as Christmas gifts for all of us to wear when Kevin and I would go home to visit. It’s fun to stay in PJs all day on Christmas! And makes for really cute photos! Well last year, with Molly being an infant, we didn’t get around to taking any matching PJ photos and this year I wasn’t gonna let that happen! In fact, wearing matching PJs is going to be a tradition for the rest of our lives! Yes, Molly will be 40-years-old and I’ll still be putting her in matching PJs with me, her dad and her 38 year old sibling. Ha! I know a lot of other families do the tradition of matching PJs so I wanted to share with you guys where I got ours. I got them from eBay! And would you believe that I spent less than $20 on each pair? Mine and Kevin‘s (I got a small in the Men’s PJ’s because I liked them better than the women’s) were just under $20 and Molly’s was under $10! Since Christmas PJs aren’t exactly something we’ll wear all year long, and Molly will grow out of hers come next Christmas, I wanted to make sure I was getting some that were super affordable! So I started doing some research online and realized that eBay has amazing prices! I, like many of you, always used eBay in the past to buy used goods. (Oh my gosh, I remember getting the absolute best deal on a Ted Baker dress that had only been worn once!) But that’s not all eBay does anymore! They sell everything under the sun, most of it is brand new with tags, for crazy good prices! I was actually really surprised to learn over 80% of everything sold on eBay is brand new. And no I didn’t have to outbid anyone. Although I do love a good competition! Ha! Most of the items on the site are “Buy it now” just like any other online store. So anyway, I thought I’d share this little gem that is eBay with all of you! You know I love a good deal and you really can’t beat the prices on the site. 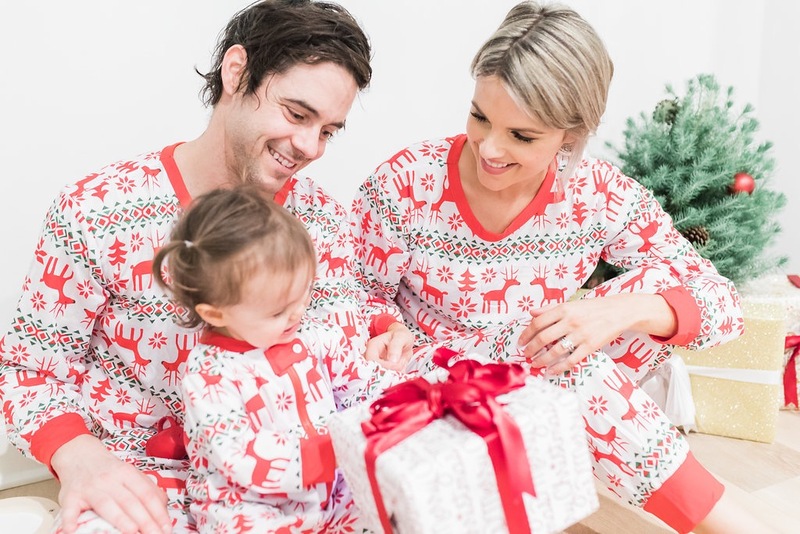 Sharing some of my other favorite Christmas PJs I found on the site below…. Have any of you used eBay in the past? Did you know that they sell mostly new stuff now? Let me know if you find any other great deals or cute items you love on their site and share them with me with links in the comments below! And tell me what photo in this post we should use for our Holiday cards!!! I love the last one too! Plus Owen didn’t want to be in these pics (He was sleeping) so I like the idea of it just being Molly since it doesn’t feel like our WHOLE family with Owen. But there are so many other cute ones too! You are totally adorable and I enjoy following you each day. You are a great mom. lol — this whole post I was wondering where Owen was!! Such cute pics, all three of you are adorable! Cute pics! Hope you and Molly are feeling better – give us an update! She seems better today! Still not eating a ton but much better than yesterday! Eeek! They’re all adorable. The first or third pics are my favorite. Love her scrunched up nose smile in the third!!! It’s hard to choose a favorite right?!?! The one where Molly is looking at the camera with a serious face and you and Kevin are smiling toward the present! They are all great but I totally agree. Use the serious face one! Serious faced Molly is pretty dang cute! I love pictures of smiling Molly, but pictures of her not smiling are just soooo adorable!!!!! I might like them better! Ha! Ali! I love your comments about eBay! I’ve been working as a lister/listing manager for a small wholesale sporting goods eBay site for 2 years and we sell new goods. Sometimes eBay is a struggle because of its “used goods” reputation (everything is all about that other store- the one that starts with an A) 😆 I have a cute eBay story for you! I scoured and found that amazing bp military jacket you love & always wear- on eBay- and swooped it up! However, it was HUGE on me! So I’m reselling it on my Poshmark site, and by chance I found an XS on there to order. I can almost always find what I’m looking for on eBay! Anyway your photos are adorable- you can’t go wrong with any of them for your card! So glad you liked this post! Best of luck with your shop!!!! Love the matching PJs! Photo 3&7 are my favorite! Agreed! These are my favourite! Love the one where you are both looking at her and she is smiling! too cute!!! What a cute family. I love all the photos but my favorite is the one where all of you are laughing and looking at Molly. So stinkin’ cute! 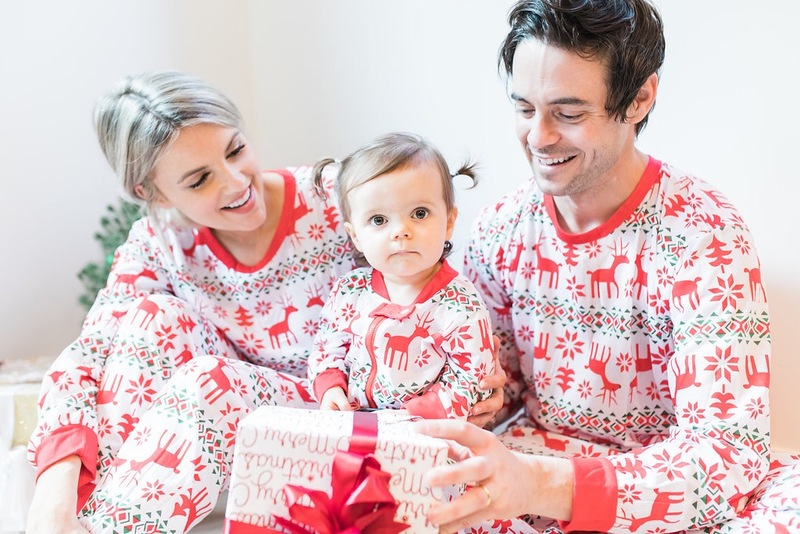 I love the Christmas jammies idea! And jammies all day Christmas Day?! YES! The pjs you chose could, in my opinion, be worn all winter! As for a Christmas card pic, wow, could you do a collage @alifedowtowsky? They’re all wonderful and show such different expressions! If pushed to choose, I’d pick #4 or the last one where Molly has her hands in the air. Thanks for sharing! I agree eBay rocks! Definitely the last one! the one with the drum is a close second! the first and third are adorable! The one where she’s looking at you smiling (almost laughing) and you guys are looking at her !! So cute ! I’ve been doing family pjs on Christmas Eve since the kids were babies and now my kids all know and expect their pjs every Xmas Eve. I usually look for something we can wear all year, but has a winter feel like plaids, but I’ve never thought to go the cheaper route on Ebay for full on Christmas pjs! Thanks for the tip! I love the third one under where it says our Christmas pj’s! Molly’s smile is so cute! I love the picture of her playing with the maraca and smiling so big! Hi! I love the pjs! So cute and so affordable! I love picture number 3! It’s so adorable! Love the pictures. Especially the one that Kevin has the present, or the one with Molly holding the drum. I loove pics #4, 6 and 7. Thanks for the links to the pj’s. 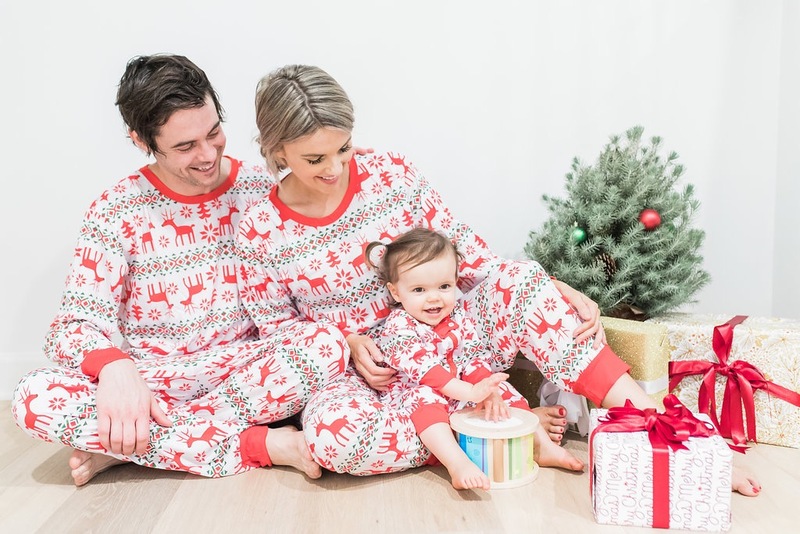 His year will be the first Christmas with our baby, so I definitely want to start a new family tradition and love the pj’s idea! Ali. This is a tradition my husband and I started last year when our son was born. He is just a little older than Molly. Now he is 19 months. Congrats on your pregnancy! Such a exciting news. We would love to start trying soon but I’m so torn. We have our son in a daycare which I hate doing. I would love to stay home with him but we can’t do that everything is so expensive. Daycare costs is another big expense. And if we have a second that will double our expense and I don’t think it will make too much sense for me to work but then we wouldn’t be able to afford things we need. I need a miracle. Also when did you start taking prenatal vitamins before you got pregnant?? Ali, they all are beautiful. Who takes all your pics in a regular basis? Cute pictures! The first, third, and fourth ones are my favorite. Gosh, Molly is so stinkin cute! My favorite is the one of her in your lap giving you guys the biggest smile! I love the last one with Molly’s hands in the air!! The one where she has a serious face and you two are looking at her. Pigtails are so cute!! I just bought matching jammies too for my family (5 year old and bou girl 19 month old twins). Happy holidays!! Adorable photos! I love the one when you are both looking at her and she is smiling! 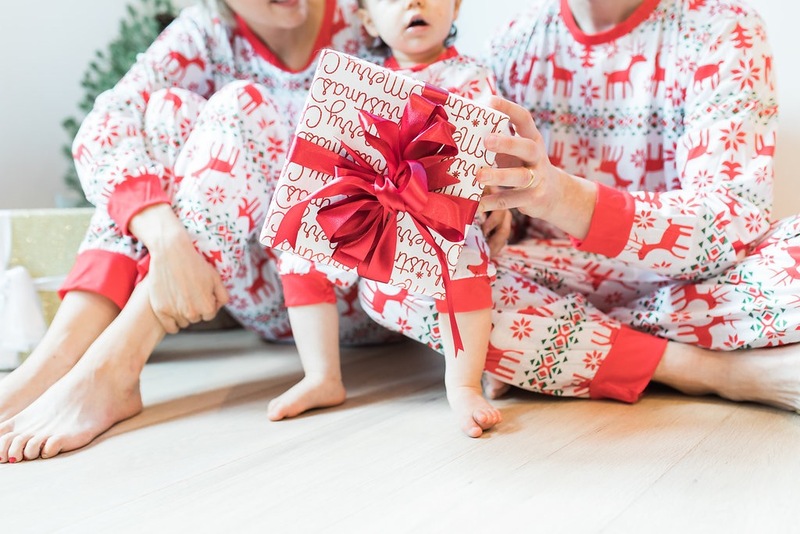 Love the pajama idea for Christmas cards! I like the pic where Molly is standing and there is a side view of her face and hair – she soo looks like Kevin. Or the one with the tree and gift in it. I wish they were numbered! They are all darling. I really like this be 3rd pic! You all look so cute! Molly is adorable! Love them all but #3 is my absolute favorite. Definitely the last one!! Adorable. All so cute!! I have an unrelated, random question. Do you only use glue on lashes? Or do you ever use more permanent lash extensions? Yours always look so good! 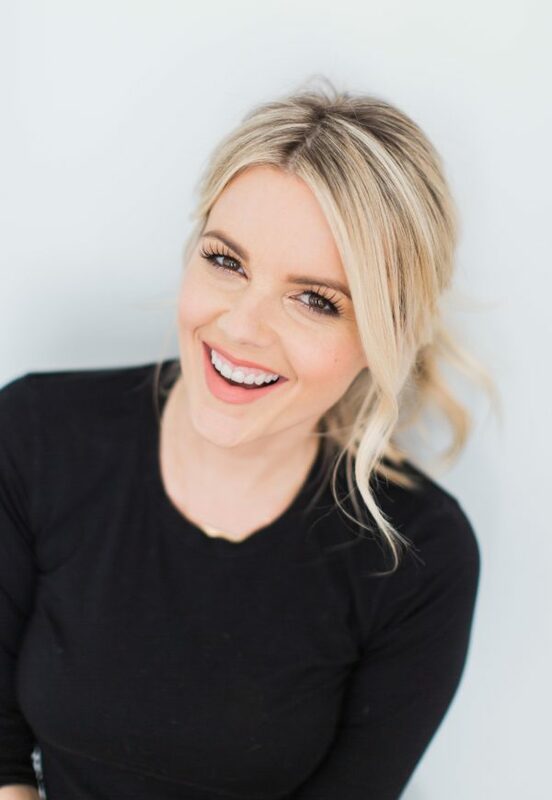 I’m newish to LA (by way of SF and originally from nyc) and due with our first baby in January and would love to look somewhat put together post-baby and lashes would help! Any advice on where to go/what to do would be appreciated! Yes! That’s my choice too for the same reasons. The one with her little nose scrunched is adorable and the one of just her with her hands in the air! #3 is so cute girly!! Hope you all have a great holiday and if you ever need an assistant would love to help you out. I like the first pic and the last one!! I love the pic of Molly front and center where she is the only one looking at the camera. Love the third one where y’all are looking at Molly and the last one of just Molly! So sweet! 3rd! Has a great amount of white space for text too and it’s so precious! Beautiful family, I’ve loved watching y’alls journey! 3 is my favorite, but I also love 6 & 8. Happy Holidays Manno Family. This is my first Christmas as a Mommy (my little guy, Ben will be 7.5 months!) and we are doing matching pjs too!! I’m so excited for Christmas now (always loved it, but he makes everything better!). Love all your photos, but my favs are the first and the last-I love the focus on sweet Molly! Congrats on the pregnancy!!! I love all of these. But 5,6, and 8 are my favorites. Especially Molly’s face in the last photo just says it all. Good luck picking them all I’m sure it’s really hard. Love the PJs you chose. They’re all so cute, but Love #3 and #4 the most. Does Kevin ever wash his hair? 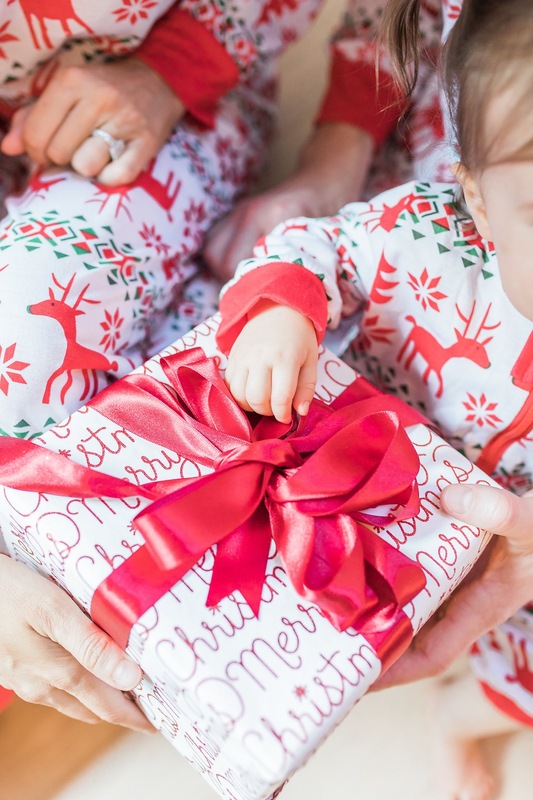 I love the first photo posted at the top of your blog post, and then the 4th and last photo after the link where you posted “our Christmas pjs”! I like to have 2 or 3 pictures on our Christmas cards – I’m a front and back kinda gal. If you’re looking for just one photo, the first photo or the 4th photo after the link my 2 favorites! You all look so happy and all your faces are showing! Thanks for always sharing w/ us, Ali-luvers. Happy Holidays!! I choose the last one! Adorable!! I would do a collage with them all! So good. Ohhhhhh that’s a good idea! I didn’t think about that! I love them all. But if it was me I would pick the last one as it’s her final Christmas as just her. That’s what I was thinking! You seriously READ MY MIND!!!! Love the one where she is looking up at you and Kevin with the huge smile. I think it is the 4th one. By the way congrats on the baby. Wow…Hard to choose. They all are great!!! My 2 favs are the one where she is looking up at the two of you. That smile is ADORABLE! My second is the one of just Molly and you and Kevin are in the background, although, her arm is blocking you, still so cute!!! I love the third or the last one! I love the 3rd one! Her little face is just so darn cute! All the pictures were adorable! So it’s hard to just pick one! By the way I love the matching pjs! So fun! Thanks for all you post I love hopping on here after work to “catch up” with you! I like the 4th one where Molly’s looking up and laughing at you…. That last one is SO ADORABLE! Molly is seriously the cutest! 😂🙌🏼😍 That gets my vote times 10! I love the pic of her in your lap but looking at you and Kevin laughing and the one where she’s striking a pose with you two in the background. They are all cute tho! Good luck choosing! I love them all! Wow Molly’s smile in the last one makes me want to vote for that one but you can’t see you in the background just Kevin. I vote for the one Kevin is holding Molly upside down! Super cute. Congrats on the new baby! I think the 3rd and the last picture are the sweetest. Number 3 is the best! The way y’all are looking at her silly smile is perfect! It really shows how much love is in that picture! Merry Christmas! They are all so good! I love the Christmas PJ idea! I think #3 or the last one for the card. You have a beautiful family! Love the pictures. Your family is adorable. Congrats on the new baby. I love the picture with you both looking a her while she is looking at the present. Last one for sure!!! Love it! I love the one where Molly is upside down! So cute!! Last one- for sure!! She’s the cutest thing!! How long did it take for them to come in? Standard shipping? I’m pregnant so I’ve been slacking on the family pjs this year!! Well I can see why you’re having such a hard time choosing! What a blessing to have such a beautiful and special family like yours. The last one is super adorable. She’s got Christmas magic all over her face. Gah! They are all adorable!! Love everything you post! My favorite is of serious Molly with the package. I think the last one is theCUTEST. Since christmas is so magical for the little ones. They are all cute but the last one is my fav. My vote is to use a few of them! It’s too hard to decide on just one! You can do a really cute card with 2-3 images! I love the first one, 4, 6 and last one. I would do one or two with the three of y’all and definitely the last one with just Molly. Merry Christmas!!! The last one with Molly stealing the show is the BEST!! I just can’t get over number 3! I know it doesn’t show yours or Kevin’s face too much, but that pure joy on Molly’s face is just soooooo perfect! !